According to a recent AON/Hewitt survey, even with small merit increase budgets, companies are still trying to spread the shrinking merit increase budgets across all employees. 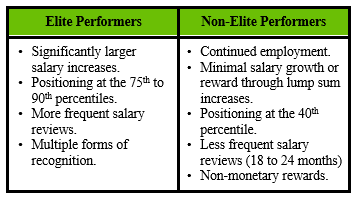 This creates a no-win scenario, as average performers who should be happy to receive an increase are disappointed that it wasn’t more and high performers feel undervalued for their contributions. For a variety of reasons, pay for performance isn’t happening in many organizations, but we want it to. • Some companies can’t figure out how to do it with small budgets. • Some companies are reluctant to do it. Top performers care about pay and expect it to accurately reflect their contributions. Key talent will leave a company if their contributions aren’t properly rewarded. • High performers are attracted to organizations that pay for performance and recognize their contributions. • High performers will leave organizations that do not reward performance. • Low performers will self-select out of organizations that emphasize high performance in rewards. • Low performers are more likely to stay with an employer when pay for performance relationships are weaker. It has been well-established that top performers should get increases that are at least two times those increases received by average performers but they are still only receiving about 1.4 times average performers, which translates to 1.2 percentage points. From research that has been conducted, the notion of why top performers should receive more in pay than average performers is they deliver greater economic value to the organization. The value difference that has been measured is an above average or top performer delivers $955,000 in real economic value versus $500,000 of an average performer. So, when we look at investing more in base salary to an average performer, we need to think about what return we are receiving on our investment. We need to improve and optimize our investment in base pay so it’s more effective in retaining top talent. The value equation gets even more pronounced when we consider that base salaries represent a significant percentage of our Total Compensation Spend. We need to focus on driving higher merit increase budgets to those positions that are strategic and of higher value and to those who are top performers. We need to move away from the creation of the expectation of an annual increase to focus on changing the cycle of increases to vary increases based on differentiation of skills, competencies and performance. Variable timing allows companies to provide greater increases to those whose performance warrants it. The result of changing our approach to base salary increases allows for different increases for different employees. A “meets expectations” performer whose base salary is at par with the market may not receive an increase for eighteen (18) or twenty-four (24) months depending on how they are paid against market. The challenge is in breaking the entitlement cycle. It creates administrative complexities that require the right HR and systems platform to handle this approach, while paying attention to the impact on discriminatory practices. It also requires the ability to truly measure and differentiate performance. We need to re-think how we manage pay relative to our pay bands or salary ranges. It is pay inequity, not pay inequality that causes negative employee reactions. Pay inequity can result from either unequal pay (with equal contributions) or from equal pay (with unequal contributions). • The organization’s ability to track, monitor and administer the approach selected. BCR has a great deal of experience helping companies to improve their compensation programs, salary planning processes and allocation of salary increase budgets.